I picked up Patti and Eva, loaded up the Mazda 6 and drove to McBee, SC to McLeod Farms for their annual Fall Festival. McLeod is famous for their peaches with 22 varieties on 650 acres. I was stunned to learn the average life of a peach tree is 17 years! My peach trees are still producing, but they are obviously failing and I thought I wasn't taking care of them properly. It turns out they are just geriatric trees, over 19 years old. Ha. It wasn't me that ruined the harvest. 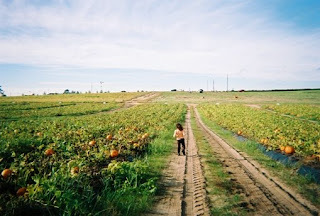 But we didn't drive through Swine-Flu laden Camden to McLeod Farms for the peaches, we were there for the pumpkins. I have to strongly recommend you go to the festival next year, we are going to invite Emma and Lexi. It was excellent. 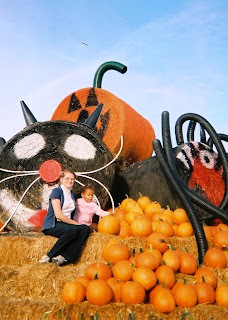 After jumping in an inflatable, we rode the hay wagon out to the pumpkin patch to select our pumpkins. 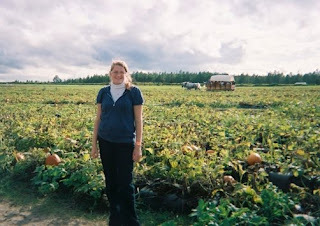 Marj was unable to come with us, so we were carefully selecting the perfect pumpkin to take back to her. We had to look through a LOT of pumpkins before we found one suitable for Marj. We finally found the perfect one and Eva found a green one for herself. We thought a green pumpkin would be very creative. I love this picture of Patti, who, ironically, I've always called "Punkin'Head." Doesn't this look like a scene from "The Little House on the Prairie" or something? 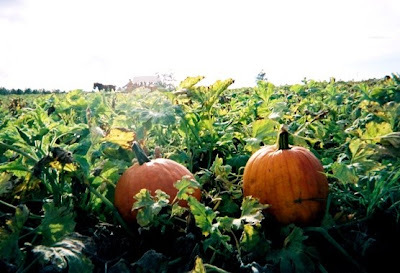 The farm continues to offer wagon rides, the pumpkin patch and the corn maze each weekend through October, so you still have a chance to experience part of the fun. 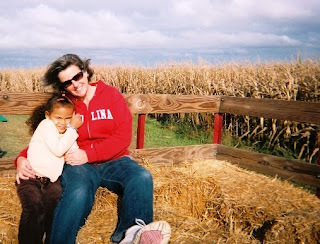 The corn maze was excellent, but I'll describe it in another post. Hey if I'm still around next Fall I'd like to go to! Sounds like a fun place. Oops-------I'd like to go "too"! Even tho I tried to FRIEND u on facebook, I dont think mine took!